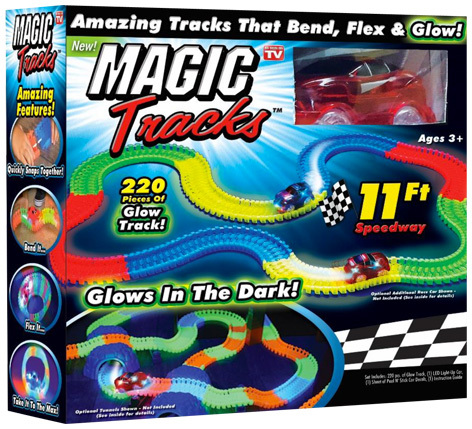 Get, Set and Glow with new Magic Tracks! The ultimate in flexible track building is here! Magic Tracks is the new way to race. The easy-to-put-together format enables young racing fans to get creative and construct their perfect speedway track in in seconds – simply SNAP and PLAY! The unique serpentine design creates a super flexible track that can bend and turn in any direction - even while a race is in progress! And, even better switch out the lights to see the Magic Tracks creation glow in the dark as the motorised car travels around. When the play is done, this cool track format rolls up to for easy storage. Suitable from age 3+ MSRP £19.99. Please tell us what you think of Magic Tracks by recreation.